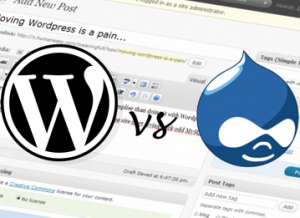 Should you use WordPress or Drupal? I spend most of my working days working with Drupal so it’s no surprise that my first blog post on my site was about Drupal. You probably noticed though, that my blog runs on WordPress. I knew someone will point it out to me and ask me why, and i got this question today from a friend of mine. So i decided to write a blog post about the general difference between WordPress and Drupal, and when you should choose one or another. WordPress is an excellent system to use when creating a website that lets you quickly get your thoughts out on the web, but while it is often used as a blog, it can be configured to work in many other interesting ways as well. I have used it several times with clients that are brand new to the Internet and having a website, yet they can pick this system up and use it quicker than the other two (Drupal or Joomla). Since WP is already developed to work as a blog, though, it can be setup to do so without any hesitation. Comments are already built into the system, as well as pinging services, multiple blogger profiles, track-backs and more. Most of the time nothing needs to be done to those systems either, because they already work the way that the user would want them to. WordPress, however, is not to be used for everything. While i know there are e-commerce sites powered by WordPress, people have had little success (its there, just not much) using WordPress as a shopping cart. The reason that WordPress was created, was to put the keys of starting your own websites in everyones hand, take for instance their famed five minutes install. But by doing it they stripped it to the bare minimum, which in turn now stops people keep people from wanting to customize it to do things that are much more advanced. It is supposed to be used as built, out of the box, because any modification that you give to it may very well cause it to break. You will find many users of WP complaining that it is not developer friendly and rightfully so, because there will be countless times in your journey to that great website that an upgrade released by the WP developers causes your entire site to simply disappear, or for those modifications that you made previously to no longer even exist. If you are the type of person who would rather hand-code the content of your pages than use a WYSIWYG Editor, or if you enjoy tweaking the code that makes up the framework of a website, then Drupal is probably for you. This advanced content management system, sometimes more closely resembles a developer platform than a traditional CMS. Its not to say that only developers can use the system though, but to say that they will feel more at home here than in the other two. Interestingly, being more developer friendly does not automatically make it more user friendly in fact the developer has to work hard to make it that way if they need the end-product to do so. There are dozens of more functions that can be used to develop in Drupal than in WordPress. Every single node has its own set of commands and tags that can be placed elsewhere to manipulate the function of the site, and this makes for a very intense experience (whether or not you know what you are doing). For those that are not so developer-minded, this can be the trial of their lives, but for people who live in code well, they can literally get lost developing some very cool websites. Now, Drupal websites can act and function in some pretty cool ways, but Drupal has the problem that it just doesn’t look that great (at least not withoput long hours of work…). I have seen very few websites built in Drupal that look and feel as good as they function. Not that they don’t exist they are just few compared to the other ones. And the problem is not that its not themable, take for example a site we made (in conjunction with U2R1media) for Amaravati a gorgeous site but we spent probably almost twice the time on the theming as on functionality. So the problem is just the opposite its very themable and customizable, but out of the box it looks like a site back from nineties, and theming has extremely steep learning curve. You can especially see this in the theme directory on the Drupal.org website, where there are dozens of these themes built to prove the exact point I just made. It’s a shame really, because with all of the development advancements the software has, it would almost be perfect with a stronger usability and design interface. It has made huge improvements with the core 6.x but more is needed and according to what i have read and saw about Drupal core 7.x they are putting a lot of effort into this area, but we will have to wait until it’s first stable release is out and then some time until all the important modules have their stable releases out the door. Strong community to help discern the dozens (hundreds) of functions, modules and patches available. Themes for Drupal has been a huge case of fail (until recently). Probably because it has been developers, not designers, that are making the themes. Getting a Drupal website published could cost you more time, and thus more money, than WordPress. While WordPress could be hosted on a very cheap hosting, Drupal needs an access to a lot of RAM. Drupal was all over the news a couple of month ago when WhiteHouse.gov remade their website in Drupal, it was definitely a vote of confidence in in Drupal’s security by a site thats one of the most targeted by hackers in the world. Now while WordPress was not chosen by the White House, it’s known that BlackBerry is considered a brand of secure communications, so much so that even the President of United States Barack Obama was permitted by his security team to have one, and when they recently remade their Inside BlackBerry blog they used WordPress. So as far as Security is concerned, i would say it should not be on top of your list if you create in either one of the systems. What do you consider to be the pros and cons of each system? Do you disagree with any of the remarks i made about them? please feel free to leave a comment. I think it comes down to what you can and want to do with your site. Looking for quick and dirty, but looks nice without too much effort, and not too much complex functionality (and eCommerce counts as complex functionality if you're selling more than just an eBook)? Go with WordPress. Need complex functionality, have the technical know-how to build it, and can afford to spend time on theming and the look and feel? Then go with Drupal. Somewhere in between? Flip a coin. Good wrap up. As a webmaster, I have been using WordPress for 4 years now. Its not that I choose it but most clients want it. I think they like WP for the “blogging” option , user friendly-interface in the admin panel and SEO.